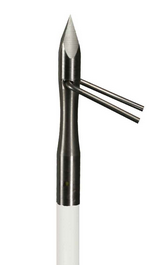 The Pro Point Arrow has a contoured body with tight fitting barbs. This creates a small entry hole. Barb's swing out to hold tight as the fish swims or as the line is pulled back. Special o-ring inside keeps the replaceable tip tight between shots. Barbs are removable making this a great practice point for beginners. Release the barbs by loosening the tip 2 full turns. 5/16” shaft. Replacement parts sold separately. Made in America!